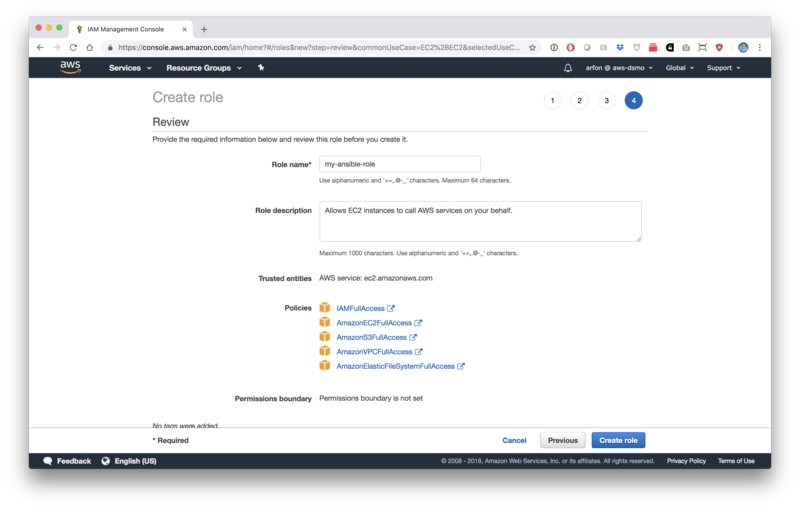 tl;dr: In this post we’re going to show you how to deploy your own self-healing, Kubernetes-managed JupyterHub cluster on Amazon Web Services using the infrastructure automation tool Ansible. Jupyter Notebooks make it easy to capture data-driven workflows that combine code, equations, text, and visualizations. JupyterHub is an analysis platform that allows astronomers to run notebooks, access a terminal, install custom software and much more. 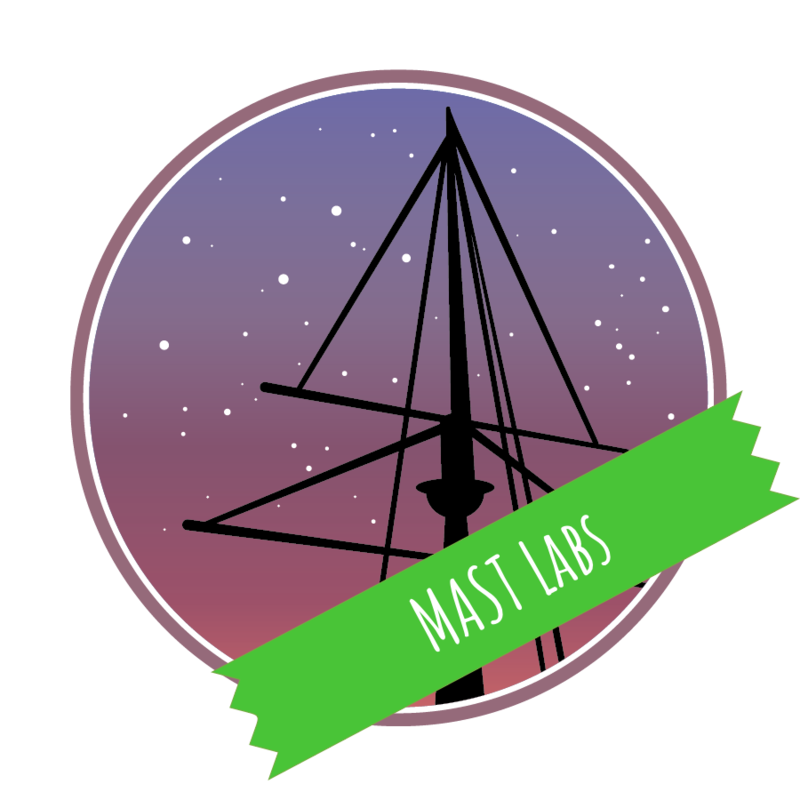 The JupyterHub environment is rapidly becoming a core part of the science platforms being developed by LSST, NOAO, SciServer, and here at STScI. 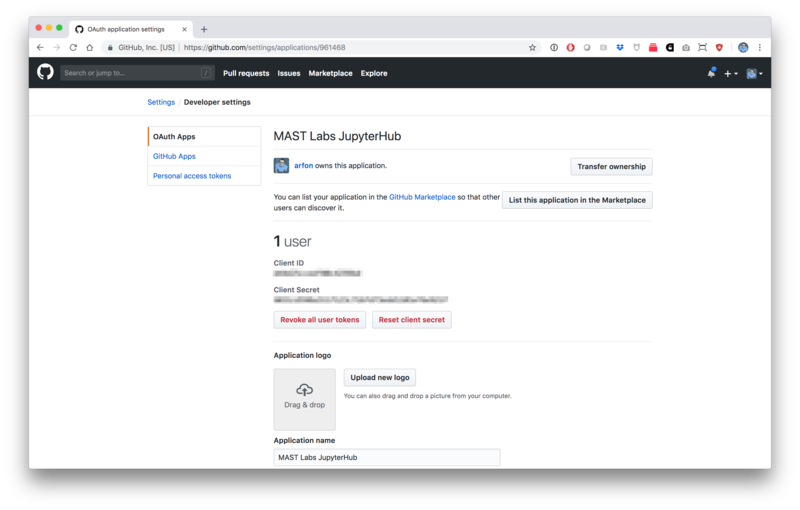 If you want to create a new JupyterHub environment, there’s a popular community guide ‘Zero to JupyterHub’ which walks you through, step by step how to create a JupyterHub deployment (managed by Kubernetes) on a variety of different platforms. As great as this guide is, there’s a lot of copying and pasting required and even for someone experienced, it takes a good hour or two to create a new cluster. In this blog post we’re going to walk you through a new resource we’ve recently released to the community which is essentially the Zero to JupyterHub guide but as an executable Ansible playbook. By following this guide, building a new JupyterHub cluster can be done with a a single command and takes about 5 minutes. At the end of this playbook you’ll have a basic JupyterHub installation suitable for use within a research group or collaboration. Before we get stuck in to the actual guide, it’s worth spending a moment defining some of the terms/technologies we’re going to be using here today. Jupyter Notebooks: The file format for capturing data-driven workflows that combine code, equations, text, and visualizations. JupyterHub: The analysis platform that allows astronomers to run notebooks, access a terminal, and install custom software. Ansible: An infrastructure automation engine for automating repetitive infrastructure tasks. Kubernetes: A platform for managing deployments of services (the service in this case being JupyterHub). EFS: A scalable, cloud-hosted file-system. In this example, the home directories of our users are stored on an EFS volume. 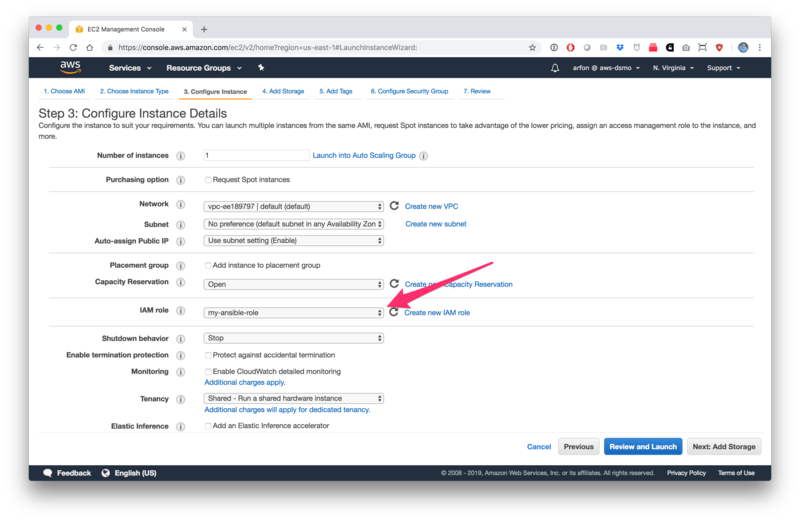 We’re going to start by assuming that you already have an Amazon Web Services account, and are logged in to the AWS console at http://console.aws.amazon.com. If you don’t have an account, you can sign up here. You’ll also need to have Ansible version 2.5 or higher installed on your local machine to execute the playbook later on – 2.4 will almost certainly not work with this tutorial. This guide walks you through how to install Ansible on Mac OSX, and guides for other platforms can be found here. First, we need to visit the Identity and Access Management (IAM) and create a new IAM role that can act on our behalf when setting up the JupyterHub console. Next we need to start up a small (micro) instance which will act on our behalf within the AWS environment when the Ansible commands are executed. Next we need to clone the Z2JH Ansible repository and make some configuration changes based on the instance we’ve just deployed on AWS. Edit the hosts file: replace the contents of this file with the CI node public DNS (IPv4) as the only line of this file. Edit the group_vars/all to configure your deployment. Allow for the ‘Verify that kops setup is complete’ step to retry as many as 20 times, it’s simply polling for a successfully setup Kubernetes cluster which can take a few minutes to complete1. FAILED - RETRYING: Verify that kops setup is complete (30 retries left). FAILED - RETRYING: Verify that kops setup is complete (29 retries left). FAILED - RETRYING: Verify that kops setup is complete (28 retries left). FAILED - RETRYING: Verify that kops setup is complete (27 retries left). FAILED - RETRYING: Verify that kops setup is complete (26 retries left). FAILED - RETRYING: Verify that kops setup is complete (25 retries left). FAILED - RETRYING: Verify that kops setup is complete (24 retries left). 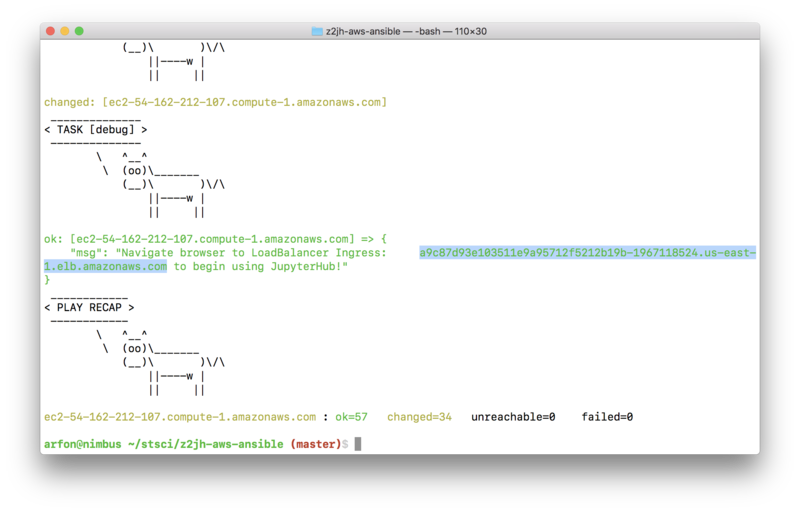 Once the play is successfully complete, the URL of your new JupyterHub environment will be printed out in the terminal. Note: you may have to allow for a few minutes for the public proxy to become available after the script finishes running. The default Jupyterhub authenticator uses PAM and by default, any username and password is accepted. While this is useful for testing, it’s really not secure enough for real-world usage. Note, the ingress value should include the http/https but not have a trailing slash. Signing into our JupyterHub environment with GitHub. To logout, simply navigate to [your ingress]/hub/home and click logout in the top right corner. 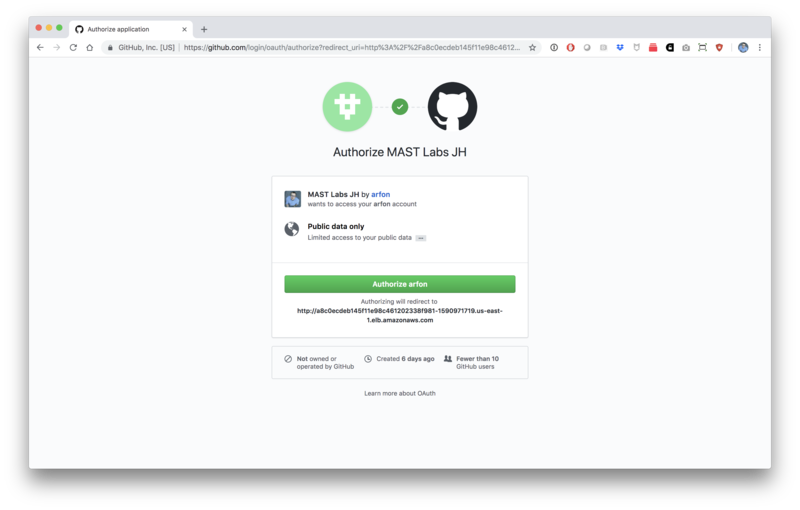 At this point, we have a JupyterHub deployment on AWS, configured with GitHub authentication. 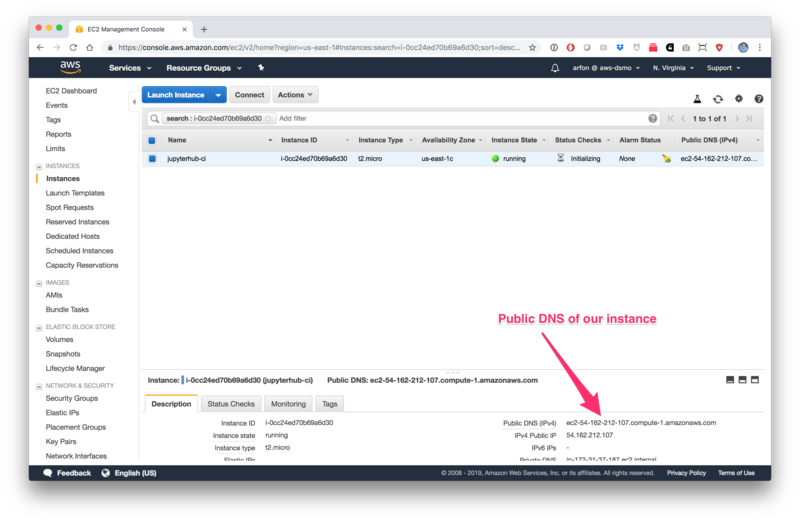 Setting up a CNAME record via the AWS Route 53 console (or using another DNS service) to point to your proxy-public ingress URL, becoming your new ingress URL. Modify the parameters in group_vars/all to choose a different instance type with more RAM, CPU etc. Change the machine environment that spawns in the JupyterHub environment by modifying the singleuser_image_repo. Idempotence is a term originally from mathematics, and commonly used in computer science and engineering to describe an operation that doesn’t change the result beyond the initial application if applied multiple times. This means, if we re-ran the ansible-playbook -i hosts z2jh.yml -v command immediately after the initial Ansible run, the playbook is smart enough to realize that all of the things you’re asking it to do have already been done. Re-run the Ansible playbook: ansible-playbook -i hosts z2jh.yml and Ansible will rebuild the JupyterHub environment based on this change and connect it back up with the original EFS volume. Note that you’ll need to wait a few minutes for these operations to resolve before attempting to rebuild anything that was deleted. This set of Ansible playbooks provides an easy way to create a simple, load-balanced JupyterHub deployment on Amazon Web Services that can be configured for your needs. While the deployment offered by these playbooks is not quite a ‘reference architecture’ for a JupyterHub deployment as it lacks some important security pieces (such as configuring https) or system monitoring (observability) we think this deployment is useful for a small team/research group to begin using JupyterHub in their collaboration. As we further extend these Ansible deployment scripts and develop our science platform and JupyterHub deployment at STScI, we’ll be updating the Z2JH Ansible repository.